The Gainesville team, playing out of the Jonesville Tennis Center and representing Alachua County, swept Escambia County 3-0 in the Combo Men’s 7.5 division final to claim the championship. Captained by Gabriel Ghita, the Gainesville squad was comprised of Daniel Berdat, Latchezar Hristov, Eric Kidd, Newton Turenne, Ziad Ghanimi, William Pelletier, Sorin Fratila, David Craig Perkins, David Hou, Erik Bayard, Leonardo Ferreira, Greg Williamson, Kevin Banes, Peter Adhihetty and John Kairalla. 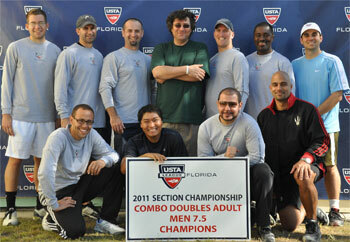 Combo Adult teams are comprised of players 18 years or older in a combined-rating format from 5.5 to 9.5. The combined NTRP (National Tennis Rating Program) ratings of each doubles team may neither exceed the level nor be more than 1.0 less than the level in which they are competing. The NTRP rating difference between the members of an individual doubles pair may not exceed 0.5.